The first of September brings a lot of new things for me, on the blog and at home! We are starting homeschooling for my daughter at the beginning of next week, which means a lot of new adventures I hope to document for you all to see. It also brings new sponsors! Once a week I'm going to be giving Spotlights and Shout-outs to the amazing bloggers and shops that have become sponsors for the fall! If you are interested in being a sponsor, no worries! There are still four small spots left for you to advertise your blog or independent business. Go check out my sponsor page for more information! Sandra over at Lara's Vintage is a woman after my own heart. Her blog is so fantastic! I have a weakness for her daughters outfit posts! As I've said before, Sandra and I connected via Instagram and became pen pals. I'm excited for that little adventure to begin, and I hope to document little part of it here on my blog! Hello, lovely Busy Bee readers! 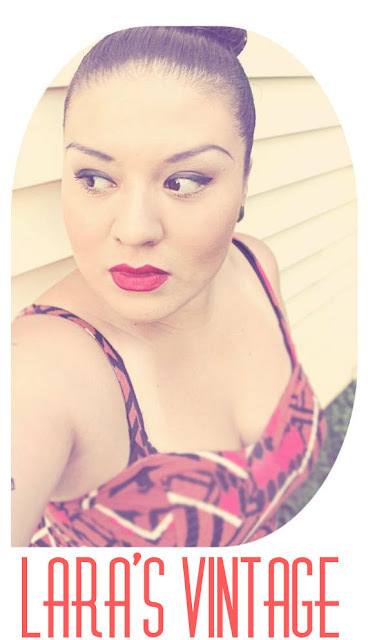 My name is Sandra and I blog over at Lara's Vintage. I'm a mama of two girls, living the military life in New Jersey. I love thrifting,photography,crafts,baking and anything vintage! Let's be friends! Hope you all go check out her blog, and pop over on Thursdays for Thrifty Thursdays Link Party! The link is on my side bar! Thanks guys! I'm excited for your homeschooling adventure! I know! I love all of get projects!